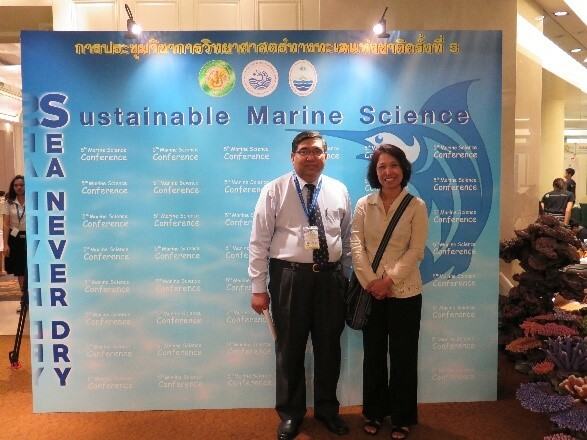 The 5th Marine Science Conference was convened during 1 – 3 June 2016 in Bangkok, Thailand, organized through the collaboration of Department of Coastal and Marine Resources, Marine Science Association of Thailand, and Kasetsart University. 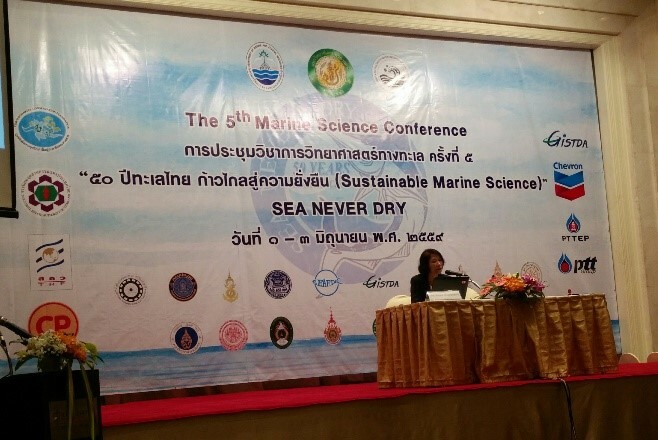 The theme of the conference was “Sustainable Marine Science: Sea Never Dry”. 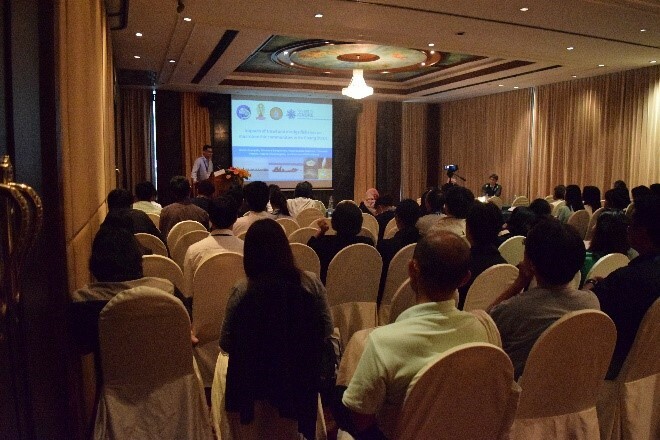 The conference program consisted of many insightful sessions, including keynote lectures, panel discussion sessions on current situation of coastal erosion, marine protected area, coral bleaching in Thailand, oral and poster sessions, as well as special exhibitions covering various aspects on marine science. Approximately 900 scientists, researchers, policy makers, managers, undergraduate and graduate students from academic institutions, governmental and private sectors, and NGOs, attended the conference. A keynote lecture of Dr. Ratana Chuenpagdee. Dr. Thamasak Yeemin (President of the Marine Science Association of Thailand), right, and Dr. Ratana Chuenpagdee (TBTI Director), left. Dr. Ratana Chuenpagdee, TBTI project Director, delivered a keynote lecture about the innovation and applications in small-scale fisheries. She emphasized the importance of fisheries as a link between oceans and coasts that provides livelihood for more than 60 million people. In order to make fisheries sustainable, we should pay more attention to ecosystem health, social justice, livelihoods, and food security. Fisheries governance is always a wicked problem. It becomes “super wicked” when there are external factors such as climate change that further complicate the situation. This requires not only the understanding of a whole fisheries system but also innovations that will help govern the system. Dr. Chuenpagdee highlighted that the innovations could be in a format of information, research, governance, and training. Besides, a transdisciplinary lens can be helpful for bringing experts from different fields to work together. In my opinion, her talk was insightful and beneficial for the participants as it showcased a new paradigm of fisheries governance that is beneficial for achieving sustainability of small-scale fisheries. In parallel sessions, a total of 13 papers related to fisheries were presented. Interestingly, most of them talked about small-scale fisheries (gill net, trammel net, krill push net, and trap fisheries), focusing on different aspects such as fisheries status, fishing methods, catch composition, by-catch and discards, and social dimension. In regards to fisheries governance, Thailand’s marine fisheries management and national policies were presented, reflecting the efforts in dealing with the IUU fishing. Problems of encroachment of Vietnamese fishing vessels into Thailand fisheries jurisdiction were also discussed since these may have a negative impact on Thailand economy, fisheries resources, and national security. Issues on by-catch were mentioned in several papers, including, for example, a study of by-catch and discards of crab gill net fisheries. The audience had also a chance to learn more about “REBYC-II CTI”, an international project that is being implemented with an aim to mitigate by-catch problems in trawl fisheries in Southeast Asia and Coral Triangle Region. I also had a chance to share my research work and illustrate the link between the impacts of bottom mobile fishing gears such as trawl, push nets, and dredge to a reduction in the abundance of marine micro-benthic species in Ko Chang Strait, Trat Province, Thailand. These reflect a growing trend in research on ecological impacts of fishing in Thailand and this region. Overall, the conference was a great opportunity for researchers, young scientists and students to present their work, see first hand the advances of research, and help find solutions for problems related to marine and coastal resources in Thailand. This could in turn stimulate public awareness on conservation of marine and coastal resources. Written by Wichin Suebpala (PhD student, Chulalongkorn University, and TBTI Research Fellow; wichin.s@gmail.com).